Marovo Lagoon in the Solomon Islands. Welcome to South Pacific gem, Morovo Lagoon in the Solomon Islands. Marovo Lagoon is 200 kilometres north-west of Honiara. Fly to Honiara with Virgin Australia (virginaustralia.com.au), then take a 40-minute flight to Seghe with Solomon Airlines (flysolomons.com). Why on earth don’t more Australians holiday in the Solomon Islands? Were we really that scared off by the happenings in its capital, Honiara, a decade ago? Truth is the Solomons are one of our closest neighbours – you can fly there in less than three hours – yet they’re one of the world’s most pristine and least-visited island groups. 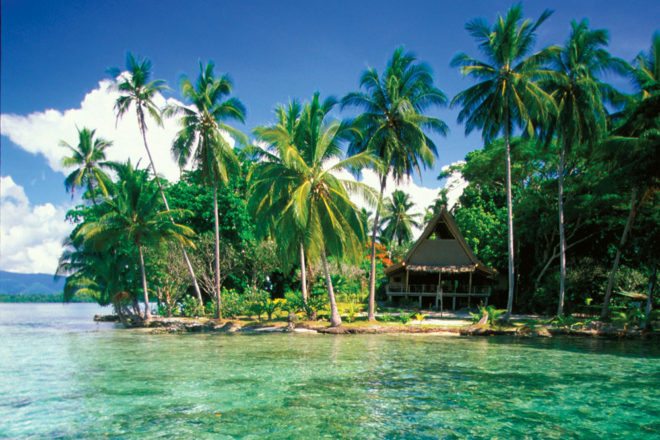 And you hardly have to be an intrepid traveller to get there: just fly to Honiara and take a daily Dash 8 flight to Seghe where you can visit one of the world’s largest lagoons, Marovo Lagoon. They call this area “the last frontier of the Pacific” – most of the locals live off the land or from the sea – you can make their day by passing them a hook or sinker as they paddle about in traditional carved canoes. There are numerous eco-resorts spread out across the tiny islands of the 90-kilometre-long lagoon – take a boat transfer direct from Seghe. And despite the fact you’re only four hours from your front door, you can feel entirely isolated from the world. The diving and snorkelling here is some of the world’s best – there’s a graveyard of sunken planes and ships from WWII below; I even got to swim with near-extinct loggerhead turtles (that weigh up to 150 kilograms). Take precautions as there is malaria in the area. The Solomons experience monsoonal conditions in summer, best avoid December to March.